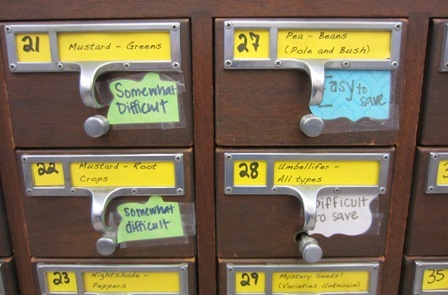 When you are planning your garden you need to plan when your harvest will begin. You don’t want to be off on vacation when the beans are ready to be picked. If you need the harvest by a certain date, knowing the days to maturity will help you decide on your planting date. It is good to know the length of harvest, also. 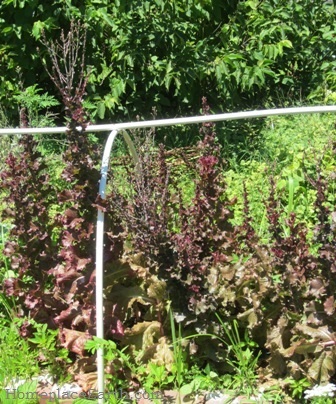 Some crops will be picked all at once and some will be picked over a matter of weeks. My garden planning skills were put to the test this year as we planned for another wedding. Our youngest son, Luke, married the love of his life, Stephanie, on August 2. I was to provide the snap beans, lettuce, garlic, and some of the flowers. Stephanie and our daughter, Betsy, were growing the rest of the flowers. Stephanie and Luke grew all the potatoes and some of the other veggies, such as zucchini, and Betsy grew the cabbage that became the coleslaw for the wedding feast. Normally, planning snap beans for an event is no problem for me. I like to plant Provider, a tried-and-true early variety. The problem is, when I sat down with the Plant/Harvest Schedule to chart when to plant and when to expect a harvest, the date I wanted to plant the Provider beans was right after we would be getting back from a week-long trip. That would be the trip to the Mother Earth News Fair in Puyallup, Washington and to Victoria, British Columbia. I did not want to worry about making sure I got that planting in. If something happened that delayed my time in the garden upon our return, I would have missed my window of opportunity. I was going to have to reach out of my comfort zone and plant another variety. I checked the seed catalogs for a variety that took a week longer than Provider to mature. High Mowing listed Provider at 50 days and Jade at 55 days. I remember a market grower friend commenting favorably about Jade at one time, so I ordered Jade. I thought it would be good to grow some yellow wax beans, also, since the wedding colors were green and yellow. It had been a long time since I grew wax beans, but I remembered them to take longer to mature and were usually curled when I grew them in my market garden. High Mowing listed Gold Rush Yellow Wax beans with the same 55 days to maturity as Jade and they were straight beans; just what I was looking for. The Jade and Gold Rush beans were planted on May 29, the day before we left on the trip. Provider may be listed at 50 days, but I usually begin harvesting six weeks (42 days) after planting and harvest over a two week period, with a little smaller harvest for the first and last pickings, but the yield is generally spread out. In Grow a Sustainable Diet, I encourage you to grow for yourself and learn the ins-and-outs of the crops and varieties before you grow to sell to others. Knowing the ins-and-outs of the varieties is important. 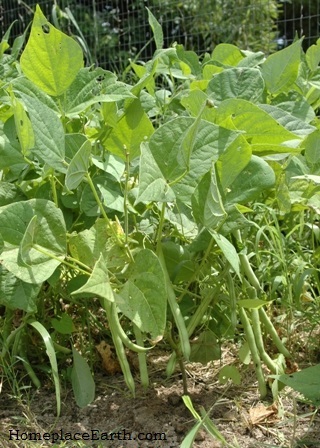 At 47 days after planting, the Gold Rush beans were ready and I picked about two-thirds of the total harvest that day. Now that I look back at the seed catalog, I see that “concentrated harvest period” was in the description for Gold Rush. Luckily the caterer was willing to take the vegetables early. I also harvested some of the Jade beans that day. At 54 days after planting I harvested two-thirds of what would be the total harvest for the Jade beans. The last harvest of both varieties was at 58 days. Since the caterer didn’t mind the vegetables arriving early, it all worked out. For Betsy’s wedding four years ago, our friend Molly catered the event and the harvest was more closely planned; vegetables arriving early would have been a big inconvenience. Even though the days to maturity are listed in the seed catalog or on the packets, it is only an approximate time. Learn what the days to maturity are in your garden for the varieties you choose. Have at least one variety of each crop that you can use to compare new varieties to, such as I did with Provider beans. Make a note of the length of harvest and nuances, such as matures all at one time, color, shape (curled beans or straight), and any other characteristics that might be important some day. This information will be extremely helpful to you if you needed to grow food for a certain event; and certainly if you needed to satisfy customers. Growing both colors of beans again made me want to include that in my plan for next year. My signature dish is a cold bean salad. 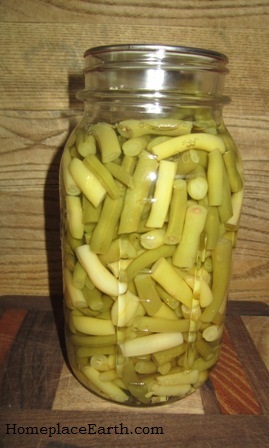 I include cowpeas that I always have as dried beans in the pantry and green beans which are either fresh from the garden or canned. To that I add anything I can think of from the garden and a vinaigrette. I used some of the Gold Rush beans in the bean salad that I made for the rehearsal dinner. I believe next year I will can green and yellow beans together especially to have on hand for the bean salad. I was able to put up some of the extra this year. Flowers are not my specialty, but the bride wanted zinnias and they are easy to grow and a sure thing to have in August. Stephanie likes puffy flowers and chose Teddy Bear sunflowers, in addition to the zinnias. 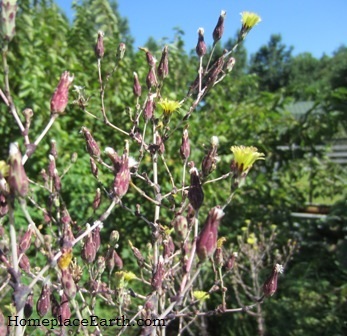 It is usually hard to find days to maturity for flowers, but these were listed as maturing at 60 days. I didn’t want to plant them too early and miss the blooms for the wedding. Unfortunately, I waited a little too long. They didn’t begin blooming until a few days after the wedding. Not to worry, there were many more things in the yard blooming that we could add, including black-eyed Susans, tansy, and Rose of Sharon, that we hadn’t planned on. Stephanie had two sunflowers ready by August 2 and the rest of her planting bloomed while they were on their honeymoon. 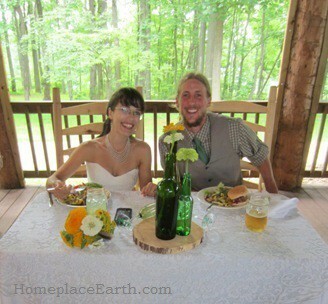 Besides the happy bride and groom, in the photo you can see Stephanie’s bouquet, the table centerpieces with flowers, and their dinner plates full of homegrown food. The wedding was wonderful. It took some planning to have the produce ready at the right time, but the more you do that, even for your own dinner table, the easier it gets. If something comes up, such as the trip for us, you will have the skills and knowledge to take it in stride. 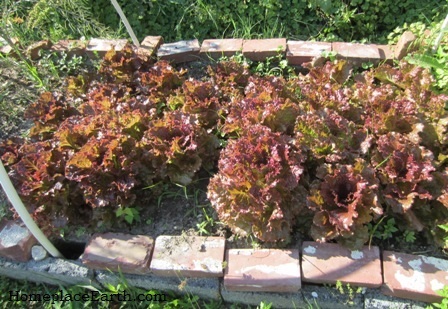 I hope your garden is producing well and that you are finding time to share it with others this summer.